Via: twichfilm.com: Michael C. Hall, already a well known face after playing David Fisher, the gay funeral director on the legendary HBO cable program Six Feet Under, and now currently hovering around bona fide cultural icon status due to his turn as Dexter Morgan, the serial killer who kills other serial killers, on Showtime's hit series Dexter, switches gears in his new film, The Trouble With Bliss, from newcomer director Mike Knowles. What was your approach to playing the character of Morris Bliss, who seems to be the archetypical nebbish struggling New Yorker? 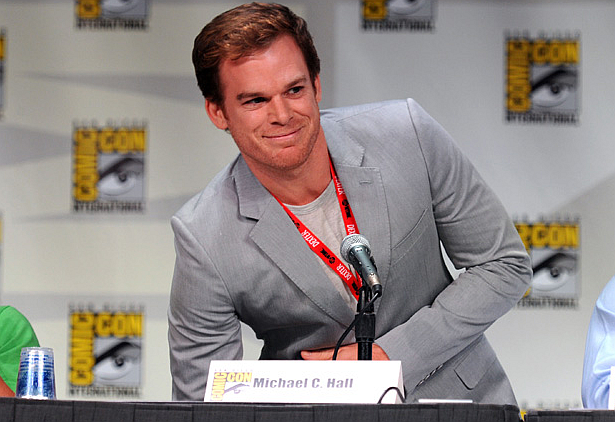 MICHAEL C. HALL (MCH) - I guess you live and die with the script first, you know? For me here was something about Morris, the lynchpin is maybe his articulation of a sense of waiting but not knowing what he's waiting for. The character type is timeless, we've seen a lot of characters like him, but there was something about what precipitates his epiphany and his ability to move forward with his life. That kind of messed up life is a relationship with a young girl, who he then finds out is the daughter of one of his old high school buddies, and that was unique to me. I feel as much as maybe it follows in tradition, as far as the type you described, it's a tradition I'm really glad to be a part of. I was wondering about your process, because your actual life has mirrored many of your roles, mainly the fact that you lost your father at an early age. I was curious about this, and your process and how the two are reckoned. How much do you let in? find a new way of approaching things. As for Morris there were things that resonated with me emotionally, you know once I put on that blue jacket, I was like "There he is". So sometimes it's something profound, like a life altering experience like the death of a parent. Sometimes, it's just something as mundane as a blue jacket. You've played a gay funeral director, a widowed single parent serial killer, you're also a song and dance guy. What's next? Is there a track for you after Dexter runs it's course. coming years I'll be mixing it up, and do some some stuff that's bigger and brassier, and stuff that's alternately quieter. What's the difference in making a film like The Trouble With Bliss as opposed to something like Gamer? MCH - Well, on Gamer I had a really nice trailer and on Bliss I had a folding chair and a little screen to change behind in the basement of a church. (laughs) Um, we moved really fast with Bliss, because it's such a small budget. Somethings were done in a single shot to that affect, and there's no post production work as far as FX. What you are doing is what it is, literally, which I maybe prefer. But the space between "Action" and "Cut" is not so different. You're playing the scenes, just maybe on a big set. Then again, there is no greater set than NYC. Oh we shot pretty much exclusively on location, so as far as the sets for Bliss went...they were great! You know, I was just lamenting to a friend that the "NY movie" is really almost a thing of the past now. Even filmmakers like Woody Allen aren't fetishizing the city like they used to. It was great to see that landscape on film again. MCH - Right. I absolutely agree. OK, so due to limited time, and to get to the rest of the cast ackowledged, how about a little word association? Here we go then. Brie Larson? MCH - Daddy. (laughs) You know he just oozes legend, with his own career, and his lineage. Gosh, what a dear, sweet guy. Let's talk about your director Michael Knowles. MCH - Oh sure. He has such an ease, you know, the set was so relaxed, and we was so prepared. He knew exactly what he wants, and he's done some acting himself, so he knows how to talk effectively with actors. He also wrote the script so that was great, because you never have to speculate about intention or anything like that. The writer is right there to answer any questions, and to have those more in depth conversations about the character and that characters intent. Again, we moved very fast, so it's like whirlwind, but I certainly enjoyed working with him. The Trouble With Bliss expands it's roll out this weekend, opening in Los Angeles, and holding over from New York, with more expansions onto screens around the country to follow beginning April 6'th. The Trouble With Bliss is also available now on VOD.